Anyway, for me, March consisted of a choir performance with Kensington Singers where I had a solo 😱, going to a couple of recordings of QI (one of which was the Christmas special – I know, this is March), watching some films from the Banff film festival, dinners out, a comedy night, joining the Put It To The People March, working on 6 Music Festival as a video publisher, trying out the Pandemonium Drummers, and somehow I still managed to fit in 8 evenings for a pop-up volunteer choir to perform a piece called the public domain by David Lang. Wow, that was a long sentence. I said I was busy! Be part of something big this spring, as 500 people from all walks of life come together for a once-in a lifetime performance at the Barbican Centre. Whether you’re a first-time singer or regular choir member, the London Symphony Orchestra and Choral Director Simon Halsey are inviting you to join over 500 people from across London to perform the UK premiere of David Lang’s the public domain. As a vocalist you’ll sing, whisper and chant together under the guidance of a dedicated vocal leader, telling a story through sound and movement and drawing together shared experiences into an exhilarating and exciting performance. The three groups will then come together for two final rehearsals, before the piece is performed live in the Barbican foyers on 24 March 2019 as part of a London Symphony Orchestra performance. I couldn’t quite imagine what it would sound like, but it seemed like an exciting opportunity, so I signed up! There were different rehearsal groups that we could sign up for: I picked the group that rehearsed on Tuesdays and Thursdays because that fitted best with my schedule. 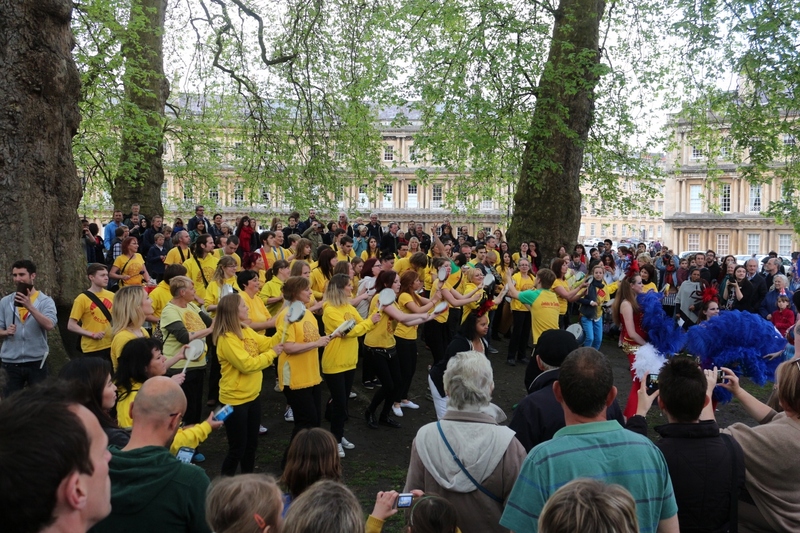 Last night, Bath hosted its annual ‘Party in the City‘ – a night of music and arts in multiple venues across the city. Even if you stayed for 10 seconds in each event, you probably still wouldn’t be able to see everything. Instead I wandered around and watched some of the other acts and took some photos. When Scott Bradlee takes a modern song and makes a vintage arrangement of it, something amazing happens. His skill on the piano is far beyond what I could ever dream to accomplish, the rest of his band is brilliant and the singers are just incredible. When you have such a talented group, you don’t need to overproduce the music. There’s no autotune and no miming. The unaltered voices allow all the emotion to come through. Real people, playing real instruments, singing with their real voices, in a single take. This is how music should be made. If you’ve ever spoken to me, you’ll probably know that I don’t get on well with what people call ‘popular’ music (I would go into specifics, but that’s another blog post entirely). Instead, whenever I listen to the radio, it’s usually tuned to BBC Radio 6 Music. The songs that play on Radio 6 would be what people call ‘alternative’. On weekdays during work hours you’ll sometimes hear songs that are also played on Radio 1, only without the drum and bass, manufactured bands or songs that I prefer to call ‘horrible noise’. Outside work hours, you’ll find the music becomes more obscure, playing all the other genres that Radio 1, 2 and 3 won’t dare to play. Whether you’ll like it or not depends on what the time is. “Ben Howard tickets? 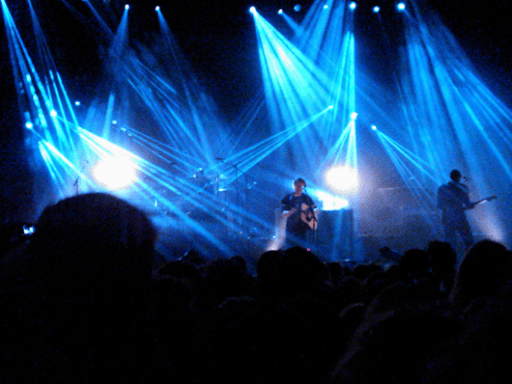 Buy or sell Ben Howard tickets!” many a person said once we left Brixton tube station. We could find our way to the O2 just by following the voices. Once we got there, there was the queue jump line for O2 customers and the long line for the sensible people who had switched to Giffgaff. But apparently, having a phone which loads the O2’s Priority app means we could get in quickly, even if it was on Tesco Mobile. Hell, I’m not complaining! On entering the venue, I decided to try to take a warm-up photo of the stage to set up my camera properly. I felt rather special as I turned the camera on and the screen said “No SD card inserted”. Realising that my card was in the other camera, I resorted to using my phone and its fantastic ability to take blurry, low res and non-zoomed-in photos. Woop. Now, I thought an upbeat acoustic gig would be the second least likely type of gig to have a mosh pit (second to a downbeat acoustic gig); naturally I was more than a bit surprised when a circle opened up not too far away from me and a fight broke out during Old Pine. I was more surprised when someone lit up a cigarette, then I was even more surprised when the guy standing only 2 places to the left of me started smoking something that clearly wasn’t tobacco! But apart from that, it was a great show! The band as a whole put so much energy into the songs, helped by the subwoofer and a bass drum (thank you sound crew). The singing was pitch perfect, which is very hard to come by in live shows these days. Ben is extremely talented (especially since he holds his guitar the wrong way), and should definitely come to Oxford on his next tour and instate me as band member #5 on keyboard, bass vocals and perhaps accordion. A few months ago, a couple of my friends said I should have a listen to Ben Howard’s music. I don’t know why I didn’t have a listen at the time, but that’s not important right now. Anyway, Ben Howard was on Radio 1’s Live Lounge last week. That’s when I remembered I was told to listen to his music. After a unique cover of ‘Call Me Maybe’ and live rendition of his own ‘Only Love’, I was sold. I bought his album ‘Every Kingdom’ that day, and it’s brilliant. The next day I checked his website, where it turns out he’d just announced another gig in London in November. So I decided I’d get a bunch of friends together to go to it. I bought the tickets 2 days later. Now I don’t part with money easily (unless I’m intoxicated), but this bloke from Devon has some simply brilliant songs. It takes true talent to be able to get someone who first listens to your album to then buy tickets for your gig within a week. Good job Ben – I’m sure my wallet will learn to thank you in time. I am properly excited, I can’t wait for November!